Preclinical studies in rodents have demonstrated inhibitory effects of glucagon-like peptide-1 (GLP-1) receptor stimulation on alcohol consumption. The effects of GLP-1 receptor stimulation on alcohol intake in primates have not been investigated. 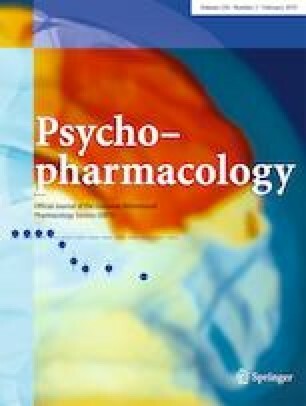 We performed placebo-controlled studies on the effects of the GLP-1 receptor agonists exenatide and liraglutide on alcohol consumption in alcohol-preferring male African vervet monkeys. 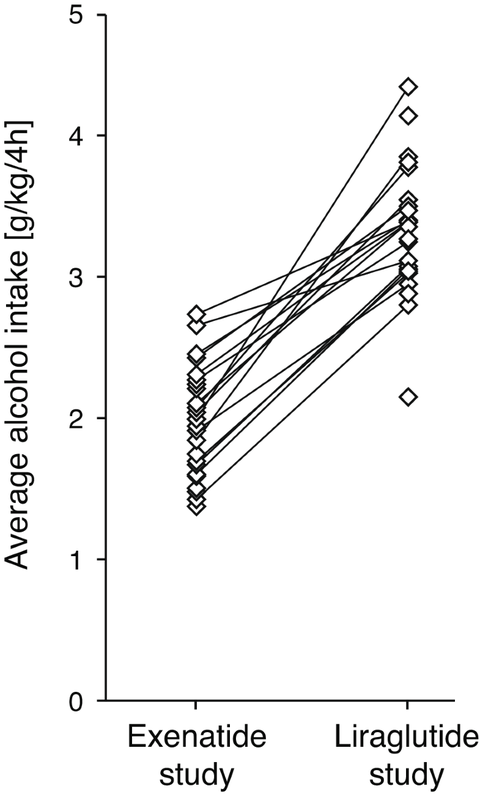 Monkeys selected for voluntary alcohol drinking were observed for at least 10 days of baseline drinking and allocated to drug or vehicle (n = 11–12 per group) balanced with respect to alcohol intake. Monkeys had access to alcohol 4 h/day. 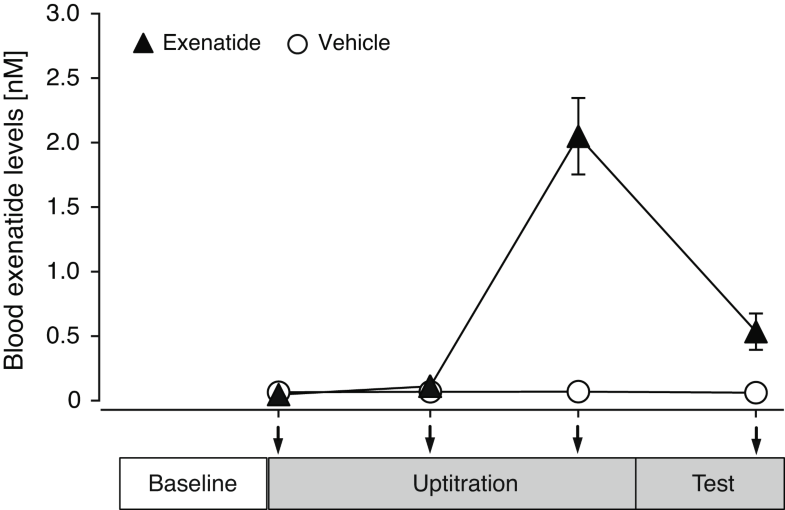 In a first study, monkeys were treated with exenatide 0.04 mg/kg or vehicle once weekly for 5 weeks to obtain steady-state plasma levels. In a second study, monkeys were treated daily with liraglutide (increasing dosing, 10 to 50 μg/kg/day) or vehicle over 2 weeks. In both studies, access to alcohol was suspended during drug up-titration. Then, alcohol was again made available 4 h/day and treatment was continued for 2 weeks, during which alcohol intake was recorded. Observation of alcohol intake was continued for a week of drug washout. 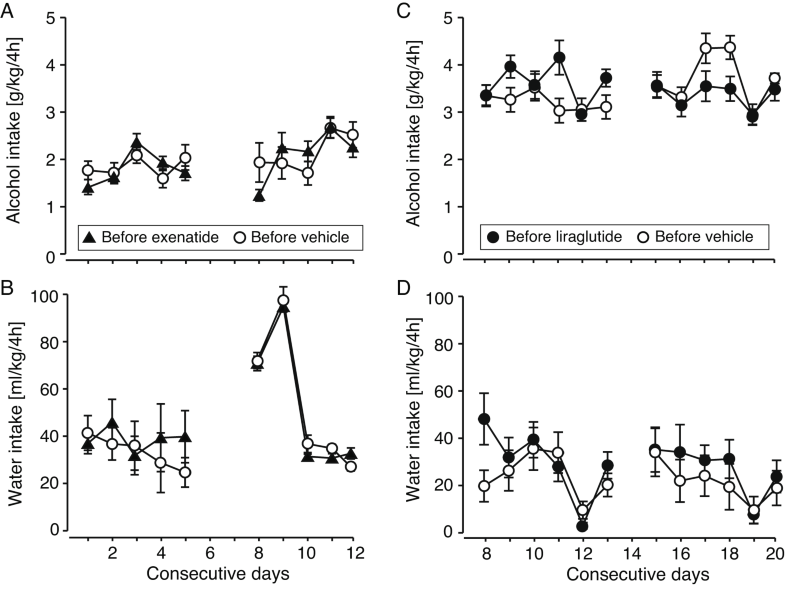 Liraglutide and to a lesser extent exenatide significantly reduced alcohol consumption without causing any signs of emesis and with no effect on water intake as compared to vehicle. The present study demonstrates for the first time that GLP-1 receptor agonists can reduce voluntary alcohol drinking in non-human primates. The data substantiate the potential usefulness of GLP-1 receptor agonists in the treatment of alcohol use disorder. The online version of this article ( https://doi.org/10.1007/s00213-018-5089-z) contains supplementary material, which is available to authorized users. We thank Professor Roberta Palmour, Department of Psychiatry, McGill University, Montreal, Canada, and Behavioral Science Foundation, Saint Kitts, Eastern Caribbean for the help with planning the experiment and interpreting the results. We thank Dr. Lotte Bjerre Knudsen, Novo Nordisk A/S for the help in choosing the liraglutide dosing regimen. We also thank veterinarian Amy Beierschmitt, Behavioral Science Foundation, Saint Kitts, Eastern Caribbean, for the technical and animal care assistance. Studies were funded by Psychiatric Center Copenhagen (AFJ). MT was supported by the Psychiatric Center Copenhagen research foundation and by grant R01AA025071 from the National Institutes of Health while preparing the manuscript. The sponsors played no role in study design, data interpretation, or decision to publish.